Can I use CSS Box Alignment ? As a member of the Igalia’s team implementing the CSS Grid Layout feature for Blink and WebKit rendering engines, I’m very proud of what we’ve achieved from our collaboration with Bloomberg. I think Grid is a very interesting feature for the Web Platform and we still can’t see all its potential. One of my main assignments on this project is to implement the CSS Box Alignment spec for Grid. It’s obvious that alignment is an important feature for many cases in web development, but I consider it a key for a layout model like the one Grid provides. We recently announced that the patch implementing the self-baseline alignment landed in Blink. This was the last alignment functionality pending to implement, so now we can consider that the spec is complete for Grid. However, implementing a feature like CSS Box Alignment has an additional complexity in the form of interoperability issues. The feature applies to several layout models. The CSS Flexible Box specification already defined some of the CSS properties and values. Once a new layout model implements the new specification, Flexbox is forced to follow it as well. I admit that the editors of this new specification document made a huge effort to keep backward compatibility with the Flexbox spec (which caused not so few implementation challenges). However, the current Flexbox implementation of the CSS properties and values that both specs have in common would become a Partial Implementation regarding the new spec. Recently Florian Rivoal found out that this partial implementation of the CSS Box Alignment feature prevents the use of cascade or @support for providing customized fallbacks for the unimplemented Alignment properties. What does Partial Implementation actually mean ? As anybody can imagine, implementing a fancy web feature takes a considerable amount of time. During this period, the feature passes through several phases with different exposure to the end users. It’s precisely due to the importance of end user’s feedback that these new web features are shipped under experimental flags. This workflow is specially useful no only for browser devs but for the spec editors as well. Any new CSS property of the new spec should be declared invalid until is supported by all the layout models it applies to. Any of the already existent CSS properties with new values defined in the new spec should be declared invalid until all these new values are implemented in all the layout models such property applies to. Browsers shouldn’t ship (without experimental flags) any CSS property or value until it’s implemented in all the layout model it applies to. When we discussed about this at Igalia we applied a less restrictive interpretation, based on the assumption that the spec actually defined several features which could be implemented and shipped independently, obviously avoiding any browsers interoperability issues. As it’s been always in the nature of the specification, keeping backward compatibility with Flexbox implementations has been a must, since its spec already defines some of the CSS properties now present in the new spec. Since it is expected that support for the features in this module will be deployed in stages corresponding to the various layout models affected, it is hereby clarified that the rules for partial implementations that require treating as invalid any unsupported feature apply to any alignment keyword which is not supported across all layout modules to which it applies for layout models in which the implementation supports the property in general. The new text added makes the Partial Implementation policy less restrictive and, even it contradicts our interpretation of independent alignment features per layout model, it affects only to models which already implement any of the CSS properties defined in the new spec. In this case, only Flexbox has to be updated to implement the new values defined for its alignment related CSS properties: align-content, justify-content and align-self. If you can try out some examples of these Partial Implementation issues, just try flexbox vs grid cases with some of these alignment values: align-items: center, align-self: left; align-content: start or justify-content: end. 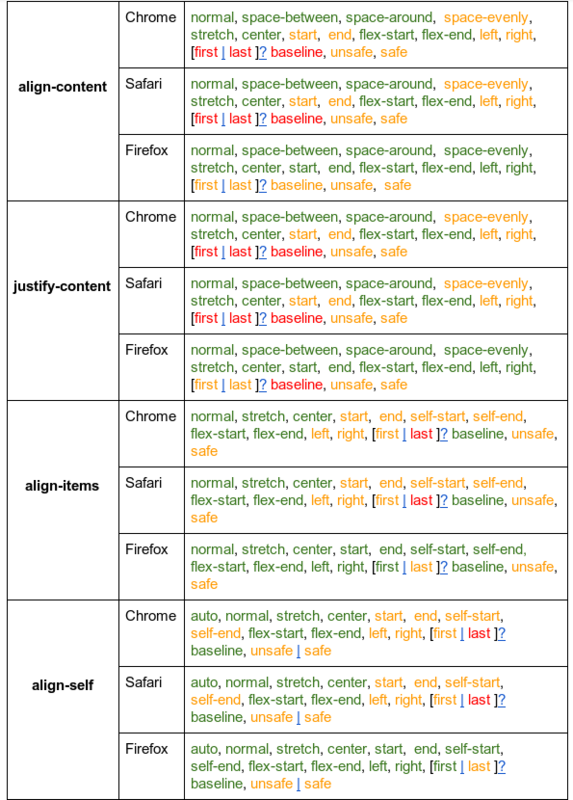 The 3 major browsers analyzed have shipped most, if not all, the CSS Box Alignment spec implemented for CSS Grid Layout (since Chrome 57, Safari 10.1, Firefox 52). Firefox is the browser which implemented and shipped a wider support for CSS Flexible Box. The 3 browsers analyzed have shipped Partial Implementations of the CSS Box Alignment specification, although Firefox is almost complete. The 3 browsers have shipped a Grid feature that supports completely the new CSS Box Alignment spec, although Safari still misses the self-baseline values. Although we are still evaluating the problem together with the Blink and WebKit communities, at Igalia we are already working on improving the situation. We all agree on the damage to the Web Platform that these Partial Implementation issues are causing, as Florian pointed out initially, so that’s a good starting point. There are bug reports on both WebKit and Blink and we are already providing patches for some of them. Thanks to Bloomberg for sponsoring this work, as part of the efforts that Igalia has been doing all these years pursuing a better and more open web.